Recently I posted about a vintage inspired blouse. Both Little Monkey and I loved it. I was just going to pair it up with jeans and call it a day. But it just didn't look right. This is the first blouse I have made. See how short it was? Since I decided to make an exact replica of the blouse (but longer) I thought I might try and whip up a pair of more appropriate pants to go with it. But what pattern to use? I remembered that Sara and Ruth posted about the Serendipity trousers and capris pattern a few weeks ago. Flat front, cute yoke, comfy fit - what not to like? So While she was sleeping I made a pair of pants that I thought were a better match for Little Monkey's vintage inspired blouse. Much better than jeans, right? These pants are made out of sweet vintage corduroy I bought from House of Cloth at the same time as the fabric for the blouse. Match made in heaven? I believe so! I love the yoke detail. It really provides so many opportunities to customise the look of the pants. One can use contrasting fabric or trims. I cut my yoke cross grain and really like the effect. I used thicker interfacing than the pattern recommended to make sure my yoke would not stretch out of shape. These pants were a really quick make. I changed a couple of things when I sewed these pants. I made the waistband adjustable and instead of topstitching the yoke in place I stitched it 'in the ditch', and I did a really good job if I dare to say so myself. I am very pleased with the pattern. The pants fit Little Monkey so well! They are super comfortable, yet stylish and girly. Once it is warmer I will make a capris version of this pattern. At the end of the photo shoot Little Monkey thought it would be fun for me to take photos of her jumping off the bench. We are talking about a child who hates being photographed, so of course I used such a rare opportunity! I love all those jumping pics. Little monkey has great ideas :) And you did do an amazing job of stitching in the ditch. I always have a few stray stitches that pop out of my ditch! 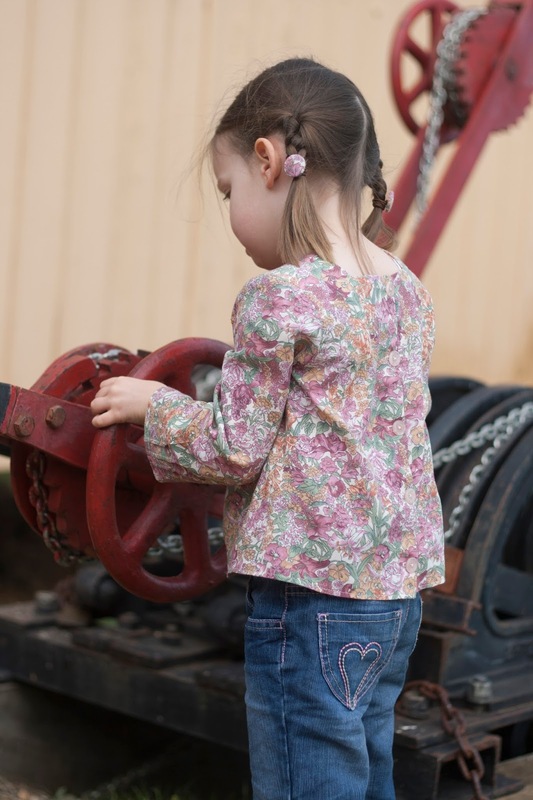 The yoke and little gathers make for a pretty and girlie pair of pants. Love corduroy on kids' pants!!! They look really pretty, and she's obviously very comfortable in them. Thank you Lucy. Yes these pants are really comfy! They have already been worn and washed a few times! Corduroy pants, love them. The yoke is pretty! So cute! I need to check out this pattern more closely. Looks ideal for school pants for the Fall and Winter! Love the corduroy! Thank you Veronica. I will be making more of these for sure! Nothing gets in the way of monkeying around! Super! Ooh that pattern looks really good! Thank you Suz. Love the fact the pattern doesn't look too simple, but yet is so easy to make! Thanks Mel. Yes, the most important thing is that they are comfy! The yoke and the pleats at the front of the pants looks like a really unique detail - I love the look of these!